Paul Feig introduces his Conductors of the Metaphysical Examination – better known to you, I and the people of New York City as the Ghostbusters – in today’s international trailer for Sony’s blockbuster reboot. Among the handful of new shots, we get to see more of Chris Hemsworth’s loopy receptionist Kevin – not what you would call the sharpest tool in the shed – as he helps manage the Ghostbusters‘ base of operations. 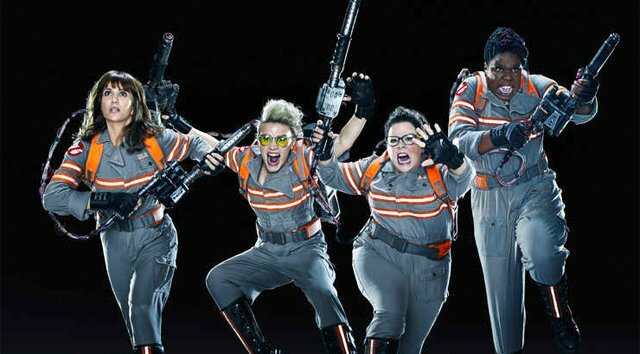 In bringing the supernatural experts to a new generation, Sony and Paul Feig have drafted in their own fantastic four in Melissa McCarthy, Kristen Wiig, Leslie Jones and Kate McKinnon, who will soon be donning the famous proton packs to combat the undead and, essentially, ward off the apocalypse. Neil Casey, meanwhile, is the one orchestrating that spike in paranormal activity as the nefarious Rowan, a loner out to ensnare ghosts for reasons that only portend all sorts of trouble for our team of ‘Busters. Based on a script penned by Katie Dippold and Feig hismelf, Ghostbusters fans of old can also look forward to a handful of cameos littered across Sony’s tentpole reboot – thankfully, they haven’t been shoehorned into any of the movie’s trailers thus far. “I think the word you’re looking for is apocalypse,” yells McKinnon, who will be warding off supernatural nasties alongside Melissa McCarthy, Kristen Wiig, and Leslie Jones when Ghostbusters lands in theaters on July 15.